We all love a bit of free food and what’s better than being able to pick it yourself!? Foraging is something that has become a lot more talked about recently, but how easy is it to forage when you live in a city? 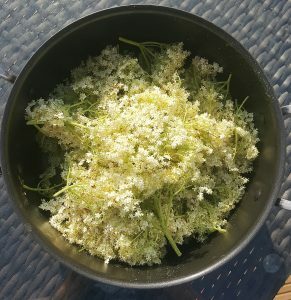 Each year I learn a little more about what I can pick when and right now we are in the middle of Elderflower season. 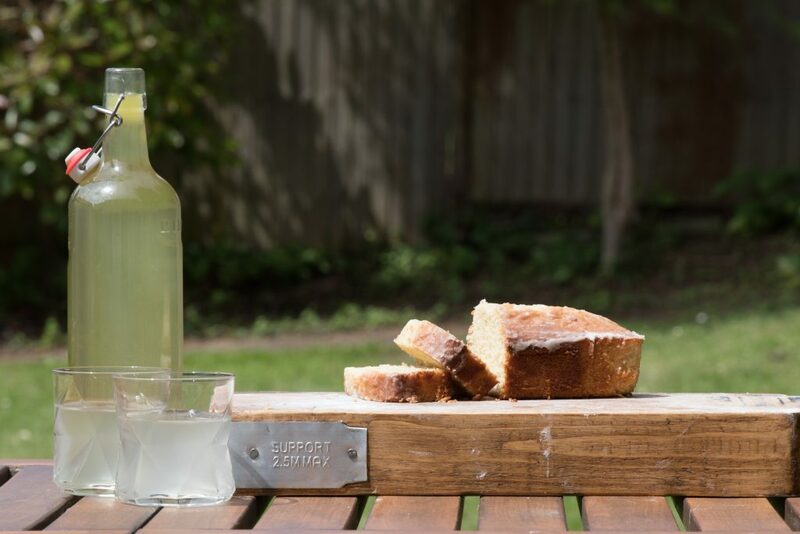 It’s such a treat to have some homemade cordial in the cupboard, so I wanted to share the recipe with you so you can make it before the season shortly ends! I recently spoke with James Wood, foraging expert who is doing a demo at this weekends Cheltenham Food and Drink festival on how he got into foraging. My expectation was that all foragers would have grown up with parents who taught them the ropes! I was pleased to hear that he started with a love for the outdoors, walking and playing outside. It wasn’t until he was doing an A-level art project making a book from natural materials that his attention got brought to what he could eat in the wild on his doorstep. And that’s the cool thing; As we go on walks in Spring, notice the heady smell of the wild garlic, or the blackberries adorning the brambles in late summer. They are all there for the taking and keep you focused on the abundance and beauty Mother Nature has to offer. As James said, you are picking produce at its peak and eating totally in line with the seasons when you forage, which is always delicious and fresh! Foraging is something I would like to explore over the coming years and I think the best way to learn to forage is to attend a course run by companies like Totally Wild UK. Prices are £25 per adult (under 12s are FREE!!) which I think is a fabulous and different afternoon out for the whole family and a great way to learn something new. James and his colleagues run courses around the UK and will be cooking at the Cheltenham Food Festival on Friday 15th June. For tickets and details about the festival click here. 1. Take a large pan or jug and mix the boiling water with the sugar. Stir and allow to dissolve and cool. 2. Remove any bugs from the elderflower. I prefer not to rinse, so as not to lose the pollen from the flowers. 3. Once the solution is cooled, add the citric acid, and all the fruit to the mixture. Stir. 4. 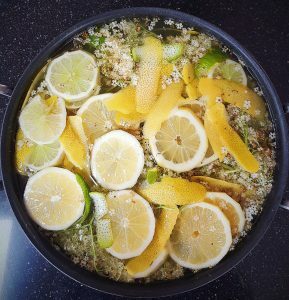 Add the elderflower to the mixture. Stir and leave to steep for 24-48 hours. 5. Sieve through a muslin of through a sieve lined with kitchen roll. 6. Pour the cordial into sterilised bottles and seal, allowing a little breathing space at the top of the bottle of 1-2 inches. 7. Store the cordial in a cool, dry place for up to 3 months. Take care when opening the bottles as sometimes they can ferment and pressure can build in the bottle. 8. Once opened store in the fridge and use within a few weeks.